At Kafka Granite, we’ve been proud to be a leader in all things aggregates in the Wisconsin area and beyond for years. Through hard work and dedication, we’ve continued to evolve our offerings to meet the wants and needs of our customers. Our latest evolution has come in the form of new natural thin stone veneer. With a wide range of natural thin stone veneers, we’re excited to unveil this new exclusive selection of masonry product. With a beautiful range of granite, marble, and quartzite, each cut and color of stone offers dazzling hues and crystalline uniqueness. But when thinking about including veneers in your next new build or renovation project, you’ll be faced with the challenge of deciding between natural and cultured stone veneers. What is the difference between the two products and how can you decide which one is right for your project? Building stone has been in use for hundreds of years. If you’re a traveler, you’ve most likely seen this building material in the Roman Coliseum and many other historical structures throughout the world. While cultured veneers are a relatively new innovation, real stone veneers have a long and prestigious history. Natural building stones are made by slicing off slabs of desirable rock such as granite, limestone, or marble, and then modifying that cut into the desired shape and weight for different applications. A typical building stone can range in depth anywhere from 3-5 inches and yield 35-40 sq ft per ton. In recent history, thin stone veneer has been developed to give them same high-quality finish as building stone, but to cut down on labor and transportation costs, and take natural stone to new applications that were previously cost-prohibitive with building stone due to the necessary footings and support. In comparison, natural thin stone veneer typically ranges from ¾”-1 ½” in depth and weights 10-15 lbs per sq. ft. If you’re comparing the cost of building stone against thin stone veneers, the building stone variation typically comes out the winner when it comes to lower costs in regard to materials, but with a heavier weight, the thin stone veneers are less expensive to ship and install. The average building stone can easily last upwards of 50 years, or longer depending on conditions and upkeep. There are many historic buildings that still maintain their original stone veneer siding. Granite, marble, and quartzite wears naturally with natural stone color throughout. 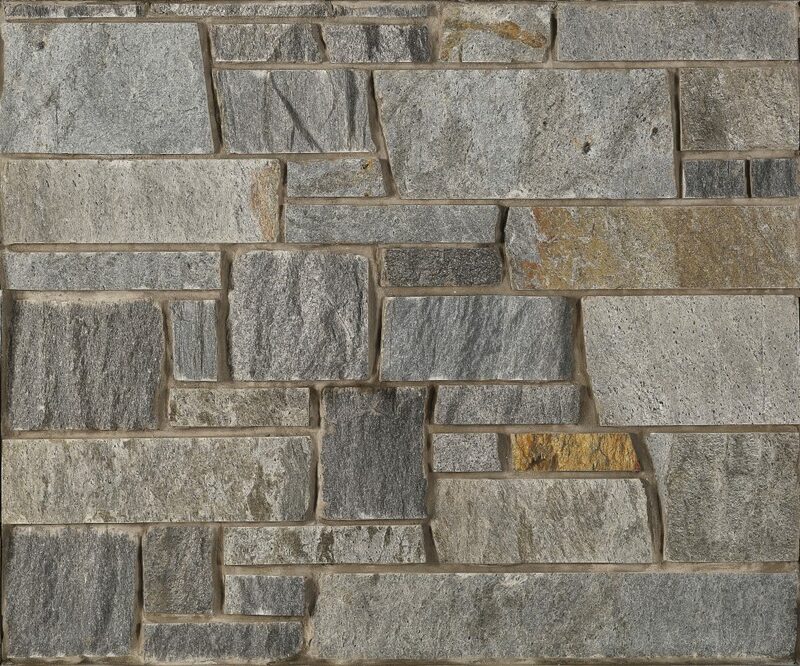 Cultured stone is a manufactured alternative to natural stone veneers to some. While cultured stone can be modified to look close to natural stone, the differences between the two go much deeper than their surface appearance. Cultured stone is created with a mixture of cement, aggregates, and pigments. These ingredients combined result in a stone-looking material that is generally more economical than natural stone veneers. Provided that these materials are mass produced rather than handcrafted, many big box stores carry manufactured stone veneers, making ordering convenient for some. But you may just find that the cultured stone use for your project is also the same faux stone being used in other builds all across your town. Building stone starts at a thickness depth of around 2” while the thin variety only goes up to 2”. The final stones end up weighing in at under 15 pounds. Being under 15 pounds, the material qualifies as an adhered veneer. The cement used to create these lookalikes is what helps to keep the cultured veneers light. You can choose to dry stack your manufactured veneers or use a traditional mortar and stone configuration. While tempting due to availability and potential cost savings, cultured veneers can end up costing in the the long run. Being colored with artificial pigments, the color is no through-and-through, resulting in a less natural weathering. Additionally, being manufactured primarily of concrete, cultured veneers require continual maintenance and care over the span of their life. Whether you’re ready to place your order for natural stone veneers today or are still conflicted as to which type of veneer is right for your next project, give us a call today. Our experts would be more than happy to discuss the benefits of natural stone.